A Sub Zero refrigerator will let you step away from a protruding white appliance and choose one that blends in with the design of your kitchen. 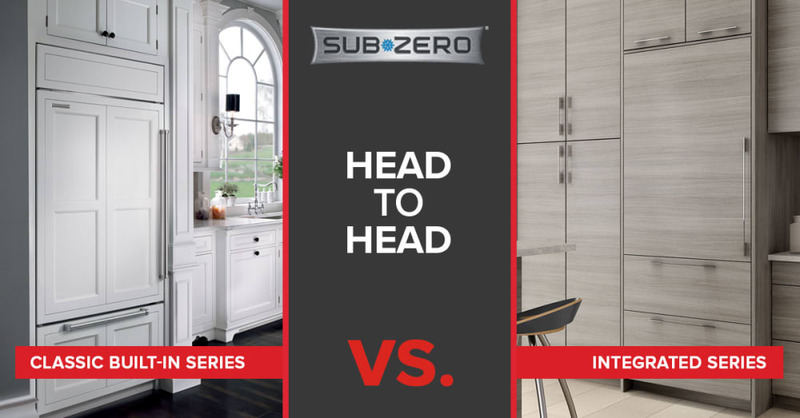 Sub Zero refrigerators come in 2 styles, classic built-in or integrated and most people are confused about the differences and need help in choosing the right one. In this article we’ll take a look at the differences between the Classic Built-In models and the Designer Series Integrated models. Sub Zero is the company that invented built-in refrigeration in the mid-1950s. It remains as the gold standard of refrigeration in the world today. Between 2013 and 2016, Sub-Zero rolled out integrated refrigeration, introducing the latest technology and aesthetic approach. Sub Zero also ownes Wolf appliances and Cove dishwasher brands. These three high-end premium brands compliment each other with their fit and finish. When designing a new kitchen you can also take advantage of package programs that the company offers for savings. Wolf ranges are especially a beloved American tradition. You will not miss their patented red knobs in most luxurious kitchens. Sub-Zero Refrigerator Classic Built In vs. Integrated? Sub-Zero has always made an all-around great fridge. That’s because they design all their food preservation systems with a focus on three essential components: temperature control, proper humidity, and purified air. NASA-inspired, anti-microbial air purification system that fights spoilage and reduces odors by removing bacteria, viruses, and ethylene gas. Built-in microprocessor that accurately controls interior temperature, and closely monitors system performance. Dual refrigeration system that creates and maintains separate and optimal humidity levels for fridge and freezer, ensuring food stays fresher longer. Magnetic door seals which help preserve cold air and proper humidity levels inside each space. Nano-coated, spill-proof glass shelves and dairy comportment that are hygienic and easy to clean. Water-filtration system for ice dispenser to reduce contaminants, as well as chlorine taste and odor. Crispers and deli drawers in low-temp, high-humidity zones that provide optimum freshness. LED Lighting for a bright and luxurious interior. Additionally, all Sub-Zero products are manufactured in U.S. facilities, and are rigorously tested to ensure at least 20 years of heavy use. Sub-Zero also offers exceptional 24/7 support from their friendly and competent Customer Care team based in Madison, Wisconsin, in addition to gold standard technical service across the nation. Pro Tip: Contact our sales team at (888)714-4938 for promotions on Sub-Zero refrigerators and kitchen appliance packages. Purchasing a Sub-Zero refrigerator is an investment. For more information, read our previous article about is a Sub-Zero refrigerator worth the money? Classic BI models are the statement makers. With their 84” tall presence, and the signature Sub-Zero louvered grill at the top, they become the focal point of the kitchen. If you want your kitchen appliances to stand out, these are for you. Proud: The box is built into the cabinetry, and the door skin protrudes slightly. Flush: A 1" space is left next to the hinge location to allow the hinge to rotate, so the door does not stick out beyond the cabinets. The interior measurements of the Classic Series are a little bigger than the Designer Series. The depth of the cabin is 24 inches, plus 2 ½ inches for the door skin, bringing the total depth to 26 ½ inches. This means that on 30” models, you’ll have 13.2 cu.ft. of fridge space, and 4.2 cu.ft. of freezer space. On 36” models, there is 16.4” cu.ft. of fridge space, and 5/3 cu.ft. of freezer space. Classic Built-In models offer a french door option, which makes them a versatile option for island or peninsula installations because the french door swing is 1/2 of that of a single door bottom freezer units. Sub-Zero cleverly redesigned the location of the compressor on the Classic BI model refrigerators, and some customers (particularly shorties like me) enjoy the additional accessibility to the top shelves this created. Modern families have different needs in terms of the amount of fridge or freezer space they require. Whereas the Classic BI family of products allow for only one fridge/freezer combination option, the Designer Series offers a lot of creativity. Homeowners and kitchen designers have the power to mix and match all models (including bottom freezer versions) to create the perfect combination unit for their project. For example, if a family would like to have a larger fridge/freezer combination, the Designer Series offers the option to create a 72" wide giant refrigerator/freezer combination by placing a 36" All Refrigerator next to a 36" All Freezer. Sub Zero even sells accessories to make this configuration look like one seamless product. The 36" All Refrigerator also has a glass door option for you to showcase your Pinterest-worthy organized fridge. Designer Series IT/IC models are completely built in. They have articulated hinges, which is a fancy way of saying that the hinges are hidden on the inside. This means that there is no need to leave extra space around the unit, making them an attractive option for those who want to have a completely modern and streamlined finish. Like the Classic Built-In models, the Designer IT/IC models have a depth of 24". Although you don’t need to consider the extra 2 ½”door skin when planning your design, you do lose some interior space. On 30" models, you’ll only get 10.6 cu.ft. of fridge space, and on the 36" models there are 13.3 cu.ft. of fridge space. On the flip side, these models have more freezer space than their Classic BI counterparts, with 5.0 cu.ft. and 6.4 cu.ft., respectively. Bottom freezer models also have 2 drawers, which allows for better organization. Refrigerator within refrigerator: For optimum conditions for your produce and meat, the new integrated models come with a drawer that provides a lower temperature, higher humidity zone. Optional internal water dispenser: On the Tall and Column 30” and 36” models, you can opt to have a one-hand access cold water filter located on the left side of your fridge. Freshness cards: To get the most out of the innovative food preservation technology in the new integrated models, Sub Zero include ‘freshness cards’. These give great instructions on proper food storage, so you can enjoy fresher food for longer. Uniform hinge valance & face frame: All switches are concealed and there are no exposed buttons. Clean uninterrupted header and valance and there is a soft open-door hinge. LED lighting: In addition to having bright LED lighting throughout the fridge with a lower LED light and enhanced light bar, you can select the ‘soft on’ feature which gradually increases the light while the door is opening. This is a great feature for those that get up in the middle of the night. Crystal look interior: Sub Zero uses frameless door shelves and interior shelving for a more modern and classy look. Flexible toe kick height: No more bumping your toes with these fridges. Your integrated refrigerator can have a toe kick height of between 2” and 6”. Can I combine a Sub Zero fridge and freezer together? Yes, you can, but you are limited with only one option in the Classic BI series whereas the Integrated series allows you more flexibility. All families have different needs in terms of how much fridge and freezer space they need so it will be down to your individual requirements as to what works best for you. By putting a 36” All fridge next to a 36” All freezer, you can make a 72” fridge/freezer combination which is your only option with the Classic BI series. Using the dedicated Sub Zero accessories, you can have it looking like it’s one product rather than two and if you like the idea of showing off your organized fridge, you can have a glass door. Here you have a wider variety of choice as you can mix and match all models to create your ideal fridge/freezer combination. The exact depth and zero-clearance hinges allow you to match a 24”, 30” or 36” All refrigerator with either an 18”, 24”, 30” or 36” All freezer. Sub Zero is the only brand that gives you this number of configurations. How do I replace my old Sub Zero refrigerator? Will the new one fit in the space of the older version? You can replace the old Sub Zero refrigerator with a new one (we cover this in our earlier posts). Please contact our sales staff for incentives and promotions on available loyalty programs. Is Sub Zero and Wolf Ranges the same company? Yes. Wolf brand is the cooking and ventilation arm of the Sub Zero. In addition, Sub Zero launced Cove dishwasher brand to cover the whole line in kitchen appliances. Sub-Zero has one of the best 24/7 customer support services of all appliance brands, so you can have peace of mind that you will be looked after should something go wrong at any time of day or night. At Designer Appliances, we have the largest Sub-Zero Showroom in the Tri-State area so there is no need to shop around. Come and talk to one of our team members and bring any plans and measurements for your kitchen so we can work out what is the right model for you. We can also put you in touch with some of our trusted professionals who can assist you in designing and building your dream kitchen. Already made your decision about which model to buy? Give us a call at 888-714-4938 and we would be happy to deliver and install your refrigerator with our factory certified crews.